I've done various jobs on my cars before and put them up as separate threads, I thought I would start this as a single thread to keep everything together. The background to this is that I wanted to rebuild an M96 engine to have as a spare for my 1999 C2, just in case anything ever goes wrong with it. 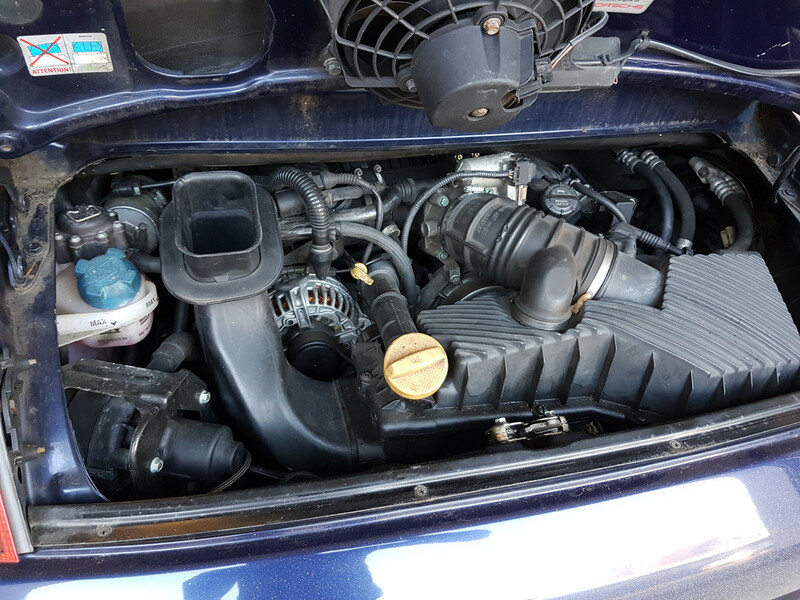 The engine I got was in pretty poor shape and was not looking like being economical to rebuild so I looked for another engine. I found this car for sale not too far from me, it was cheap due to being on super high mileage, 192k, but had the engine changed not all that long ago and it runs really well. Now that I have the complete car and it only cost just over £9k I thought I might turn it in to a project car, basically something which is a bit more focussed for road driving than my C2, but not as crazy as the turbo. Given that the C4 uses the same basic chassis as the GT3 and this has an aerokit it seems like a good place to start. The original spec for this included the factory aerokit, x74 lowered suspension, switching sports exhaust and the sports seats. 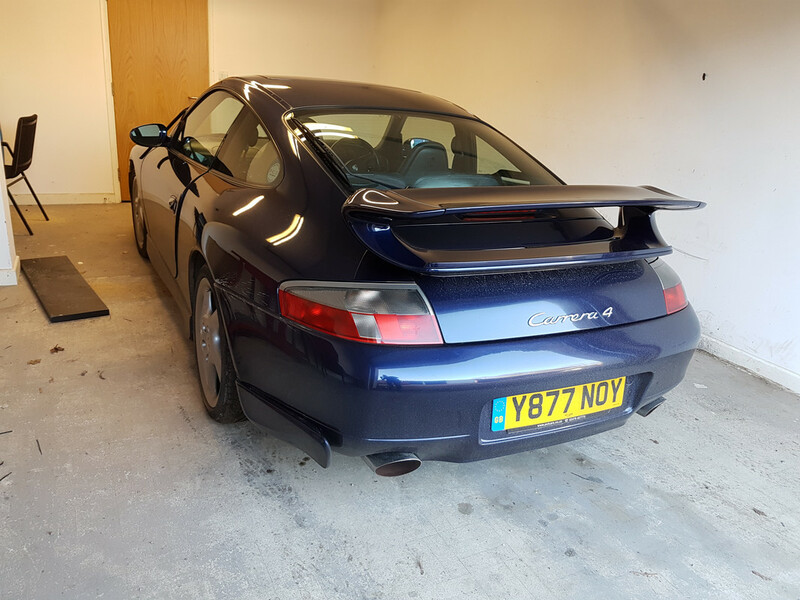 The bodywork is in pretty poor condition, so it will most likely end up with a full respray to get it looking spot on, before then it will get a replacement front nearside wing as that has a ding in it. 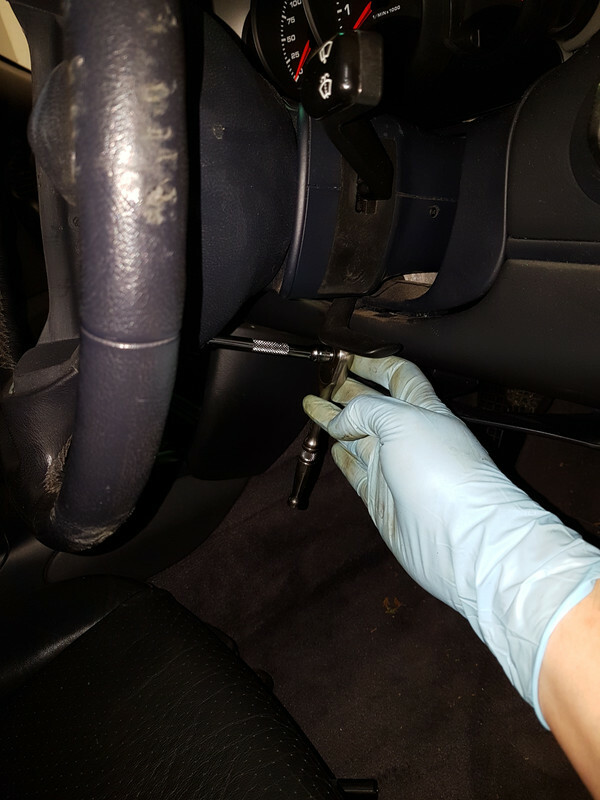 The car has been looked after by PCT in Solihull who are now closed, it recently had new brakes all round and a new steering rack. Things I know need doing on the car. Windscreen trim is loose on the nearside, not much of an issue as the windscreen will come out for the respray. When I picked up the car the passenger side footwell was slightly damp. This had cleared up completely by the time I had driven for an hour to get home. The first thing I wanted to look at was the dampness. 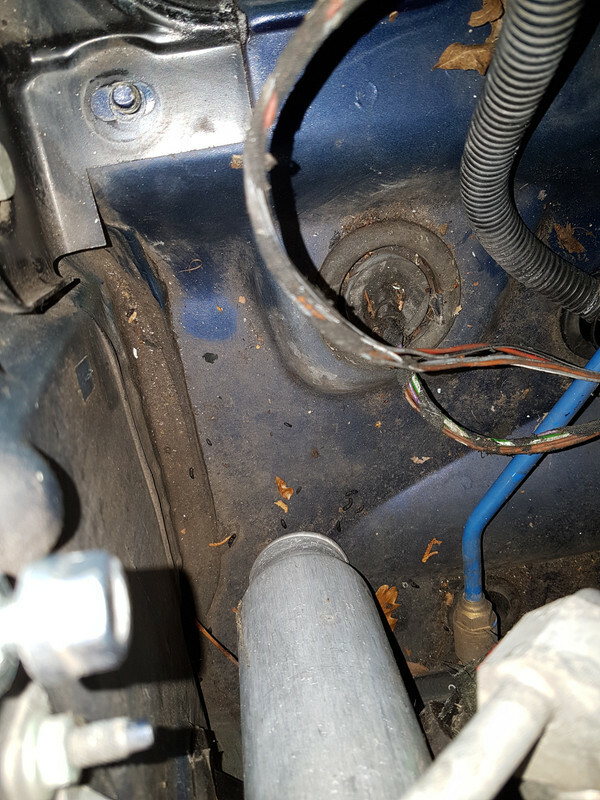 I know that these cars suffer with blocked drains around the battery compartment, which can lead to water sitting in the battery tray and getting in to the car. Put the key in the ignition and turn to position 1. 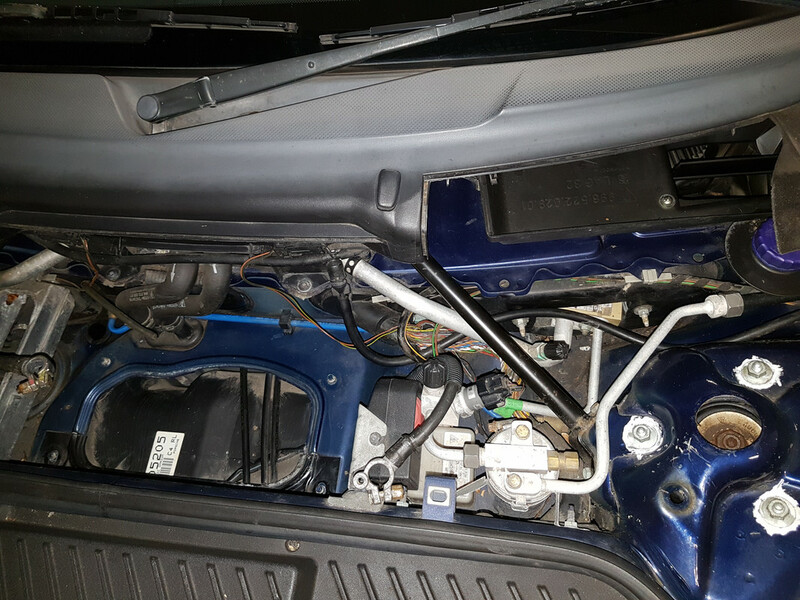 I then also undid the 4 nuts which hold the battery tray down and removed that. As is often the case there were a lot of leaves in there. 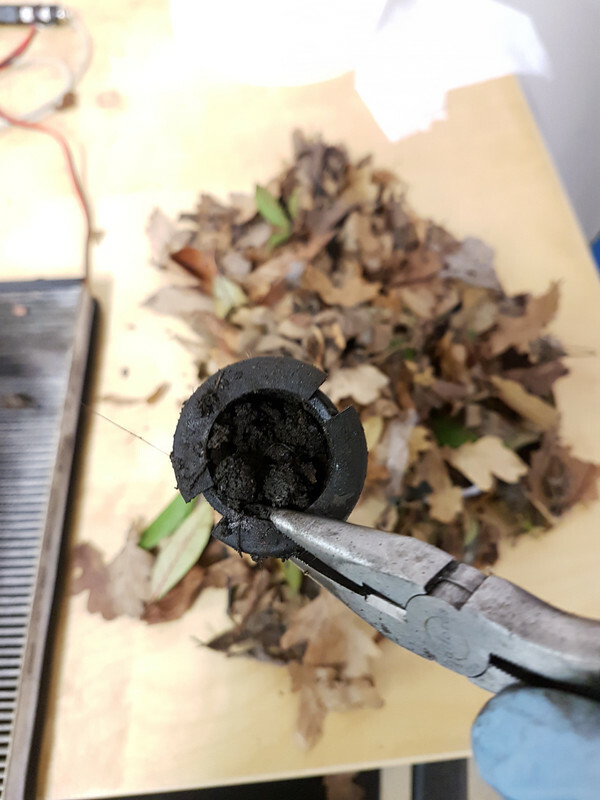 Two of the drains were removed for cleaning as they were totally blocked, the filter for the cabin air also looked pretty bad. 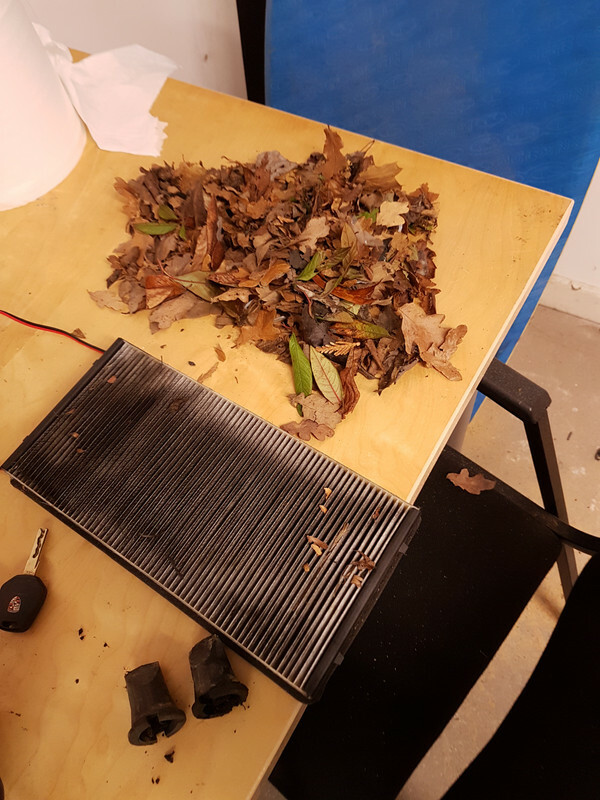 A lot of the leaves were pulled out by hand, I then followed up with a vacuum cleaner. I will give the area a good wash down, the battery tray will be cleaned and painted before going back. 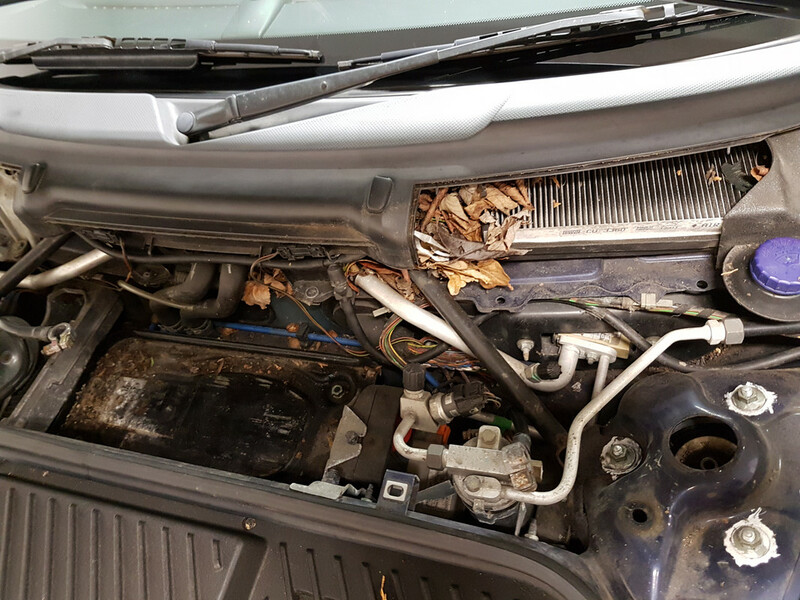 It suprises me that cleaning this area out isn't covered by servicing, it is a known issue on these cars. Nice wee project it seems. Going to check my battery area as a matter of course now. Just curious, why do you need to turn the ignition to 1 before disconnecting battery? Great thread, will follow with interest. That it had managed the best part of 190k miles on the original speaks volumes for the solidity of these cars. 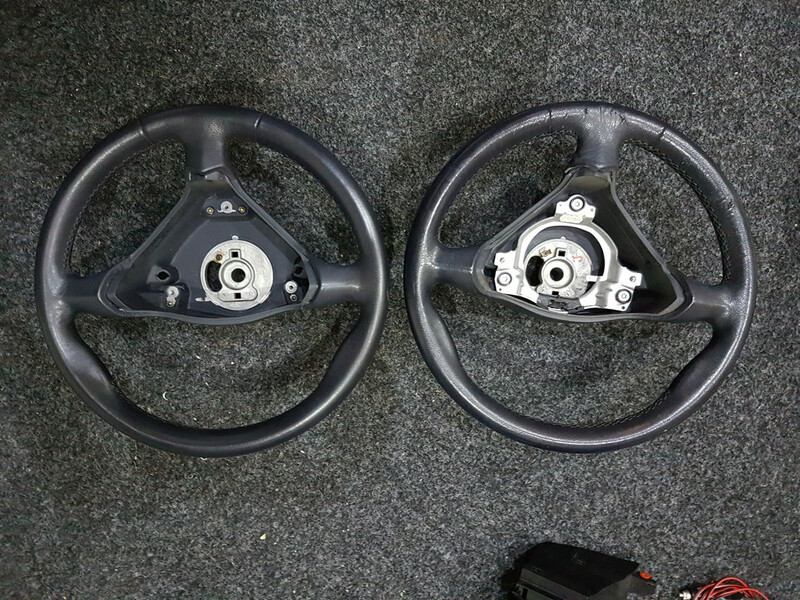 If you are considering a GT3 rep and want the original shape gearknob, then the Alu one you have will fetch good money. If you don't do that with the ignition then the alarm will go off. I did wonder about the gearknob that was on the car as I don't like it. I much prefer the one on my C2. 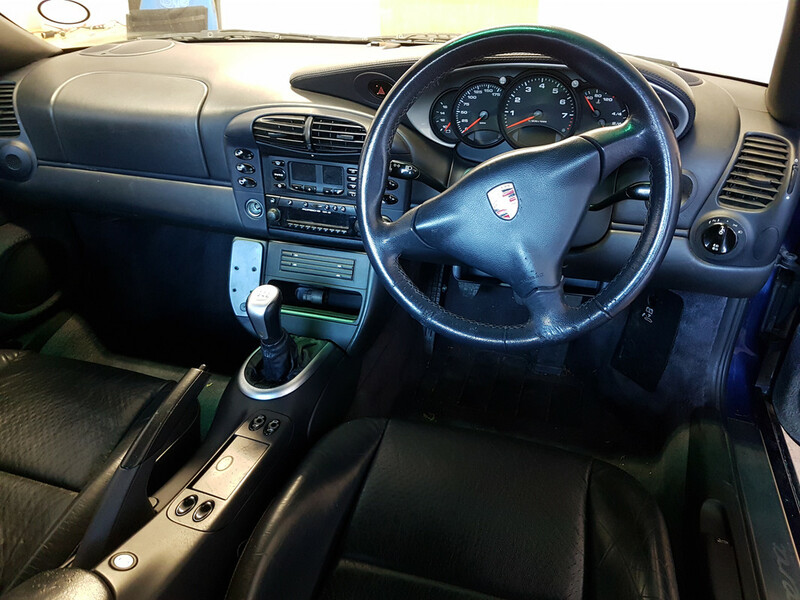 So thanks for that, it will be up for sale when I get around to painting the centre console, fitting a SSK and fitting the GT3 centre console delete. I finished with the vacuum cleaner and a damp rag around the battery compartment, cleaned up drains have been put back in. I then moved on to the inside. 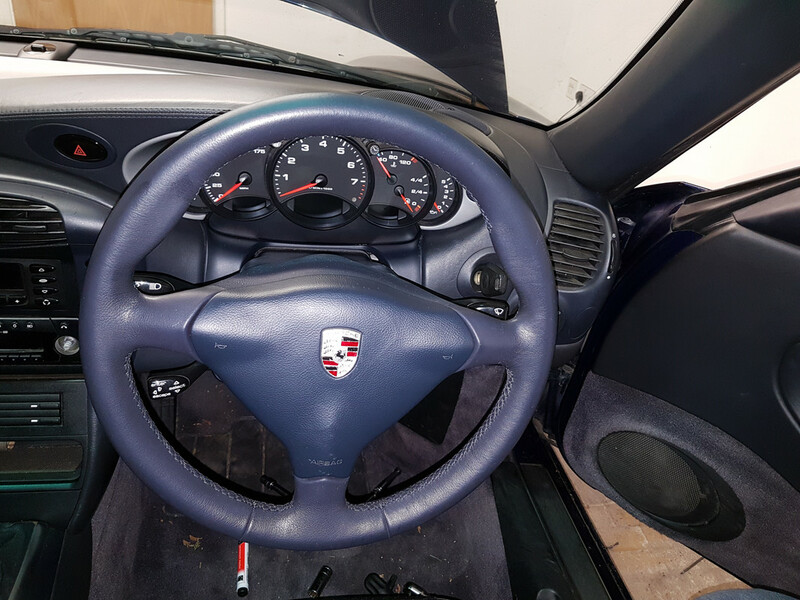 Steering wheel is coming off to be swapped for one I have in good condition, this one will be going off to Jack to be retrimmed in alcantara. 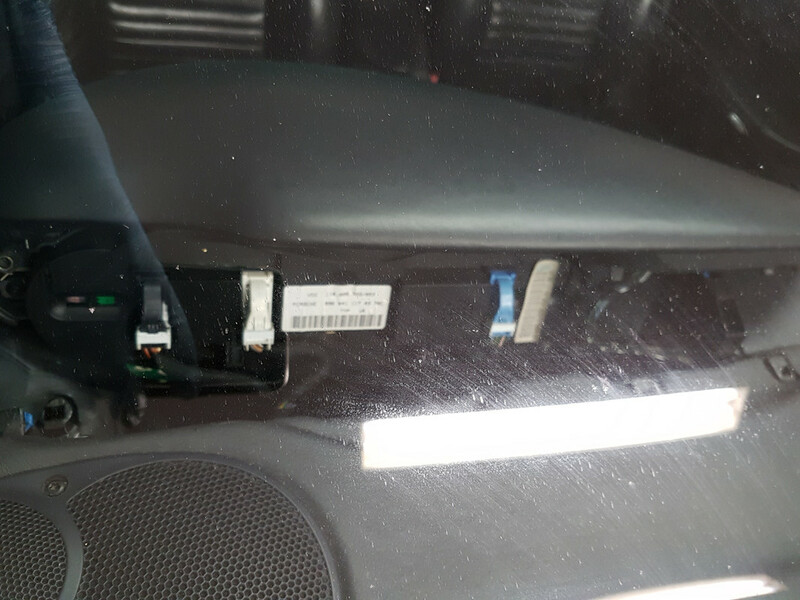 Battery has been disconnected for hours so the airbag circuits will be off. 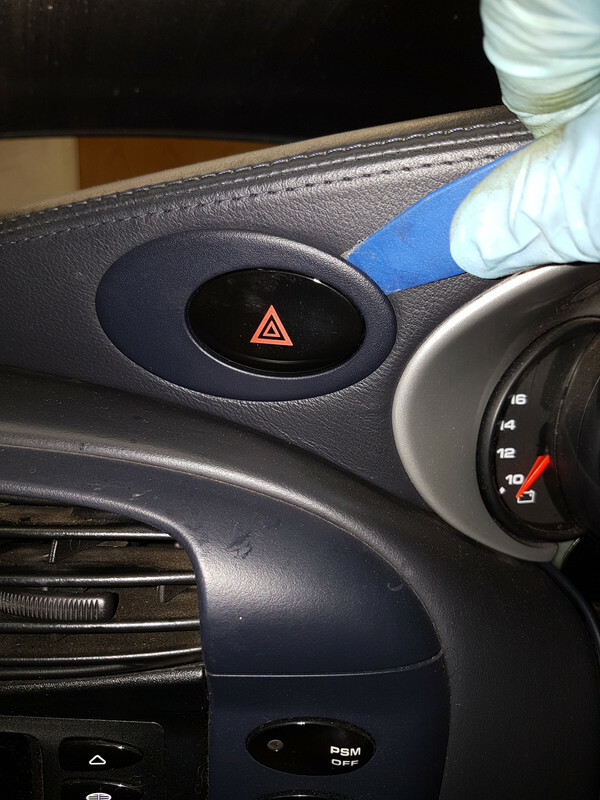 Use a T30 torx to undo the two bolts holding the airbag on. Remove the airbad connector and place aside. Undo the large nut, 24mm, but don't take it off completely. pull the steering wheel to make sure it is loose. Then remove the nut and spring washer, mark the wheel and column so you know where TDC is. Remove the two spade connectors and remove the wheel. tape up the clock spring to stop it moving around (not done yet). 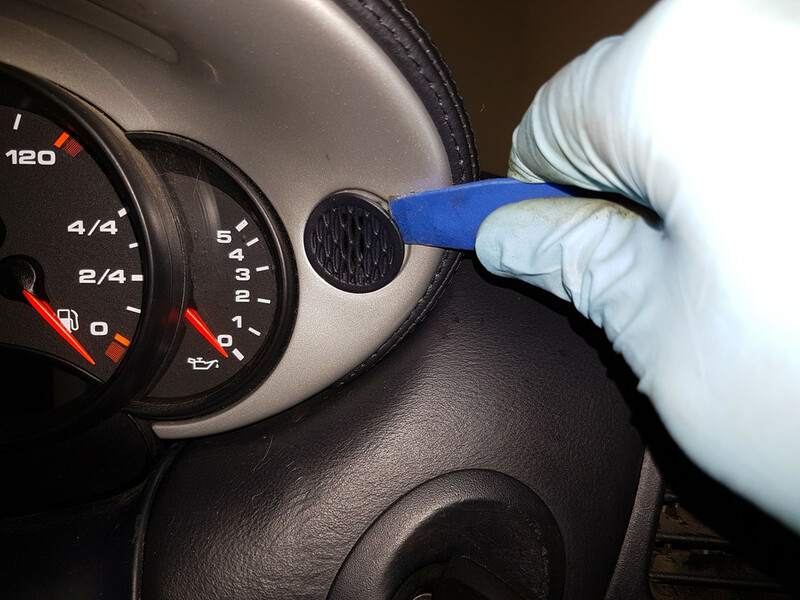 Use a trim removal tool to remove the hazard light surround and the microphone. Undo and remove the T20 torx screws behind these. Remove the hazard light switch by pulling on the white section whilst squeezing in the two black tabs. 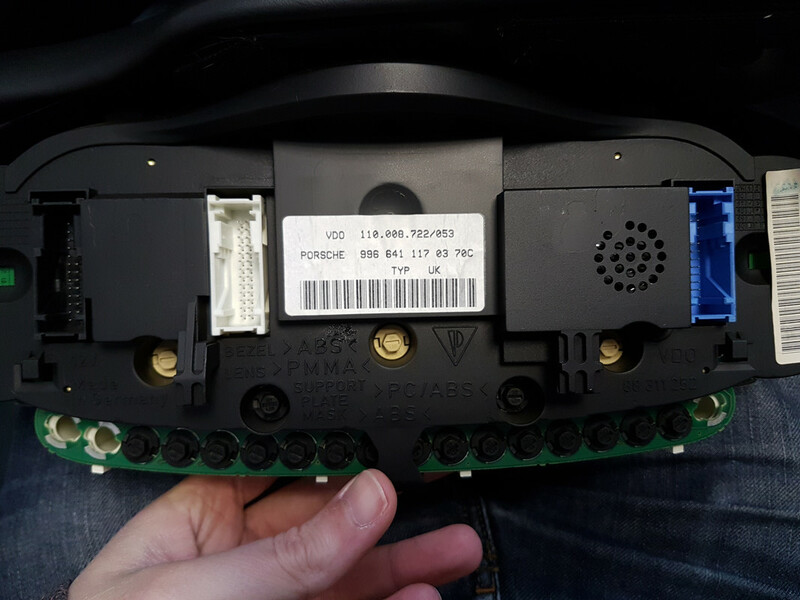 Lift the instrument cluster up and undo the connectors on the back. The instruments are now out, new bulbs should be here tomorrow, then it can go back in. The LCD backlight bulbs are the beige ones in the photo. One was blown but I changed all three so that the brightness was the same on them all. 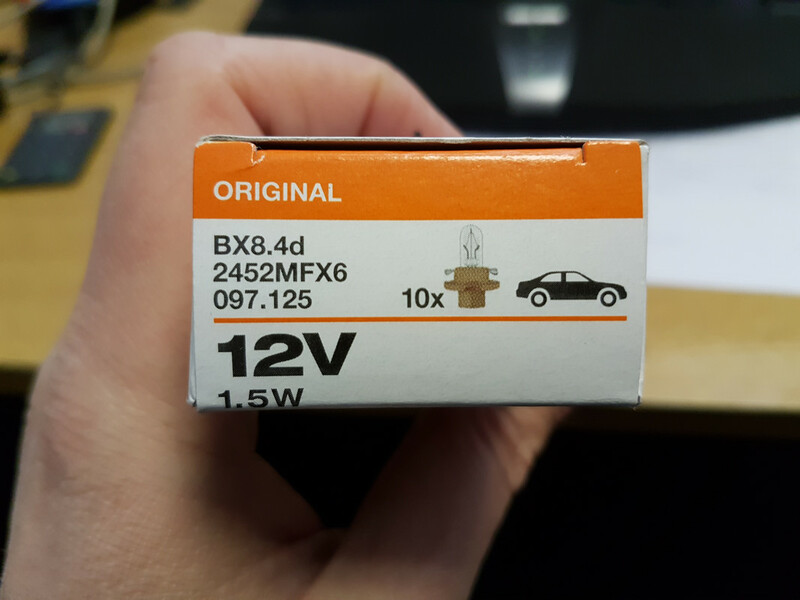 Osram 1.5w. Instruments refitted, just the opposite of taking them out. This is a super easy job to do so no excuses for having blown bulbs. Drain tubes should be cleared as part of a service .. Any service . 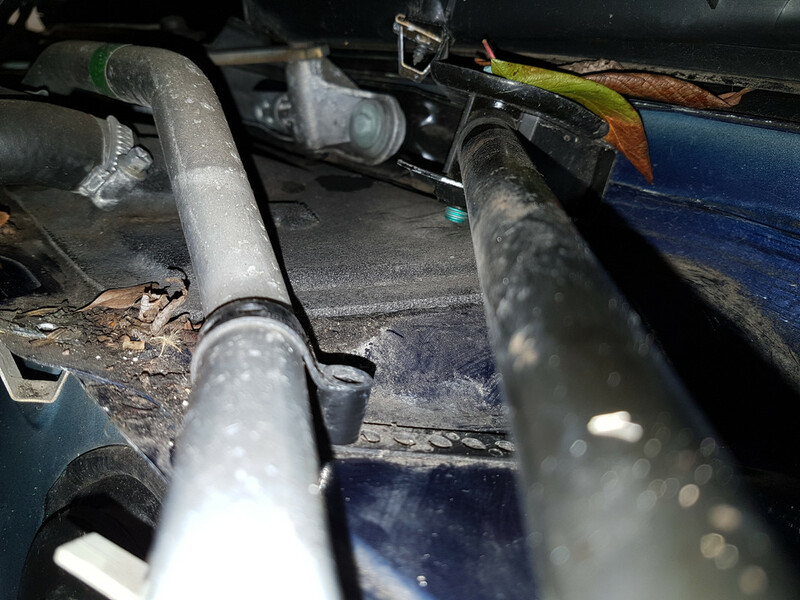 Have a quick look at the foam panel behind the battery that the x2 heater pipes go through .. it can come unstuck or worse mice love to chew it and it will cause water ingress . The leaves cant collect there so i suspect mice . 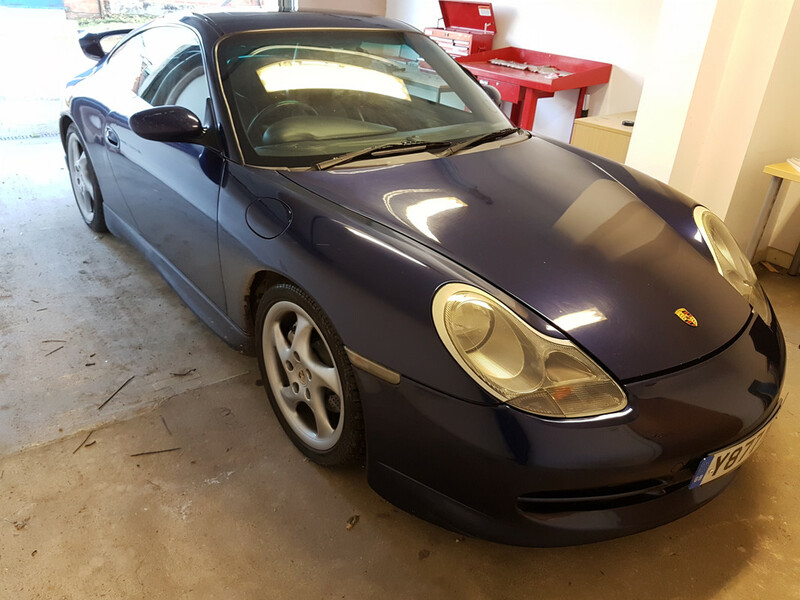 and get a heat gun on that scuttle - will bring it up like new.......oh......and an amberectomy too looks great on any colour 996. 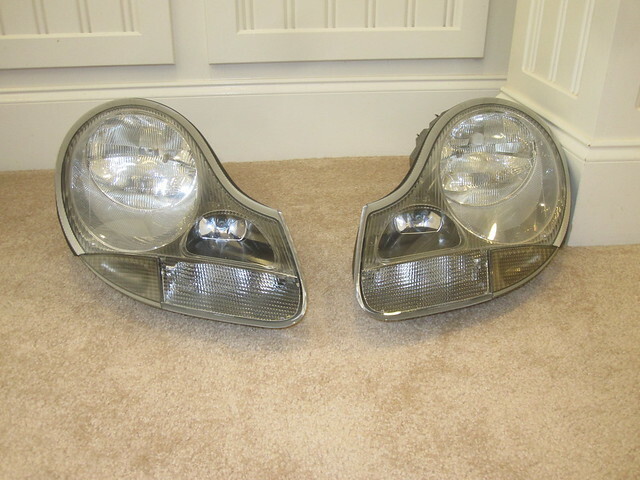 Both jobs don't cost 'owt apart from some silver flasher bulbs. Gives the light units such a 'fresher' look. Thanks, I'll check it out. Does it just pull out? If it is glued in place can it be inspected without unsticking it? There were a lot if leaves all around that area, a mix of very old to recent. 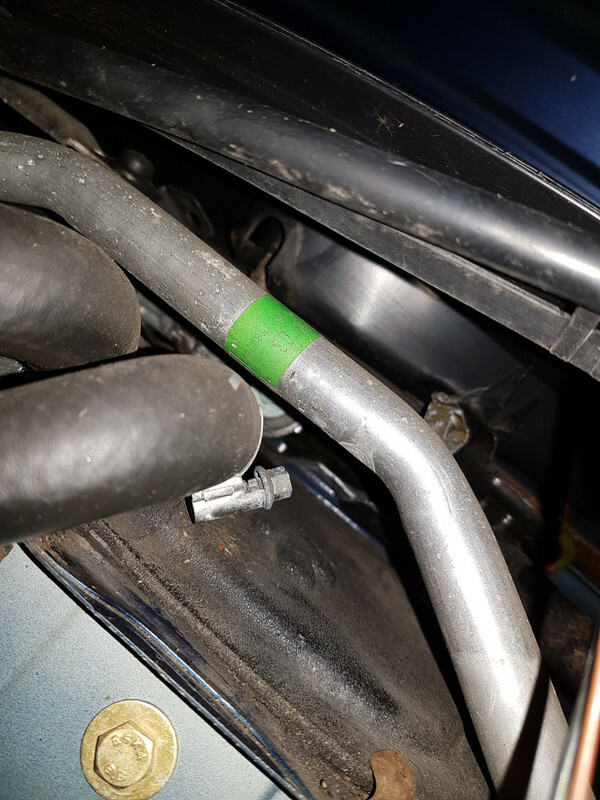 I undid the two torx bolts holding down the front of the underscreen plastic and lifted the front up, I was able to get a pretty decent view of the foam piece behind there and it all appears to be in good condition. It was easier to inspect visually than to take photos of it. There are what appears to be small black droppings which I assume are from a rodent of some kind. I will very thoroughly clean the area all around there and then go over it with some weak bleach/water solution before cleaning again. That should test out my drain tubes as well. 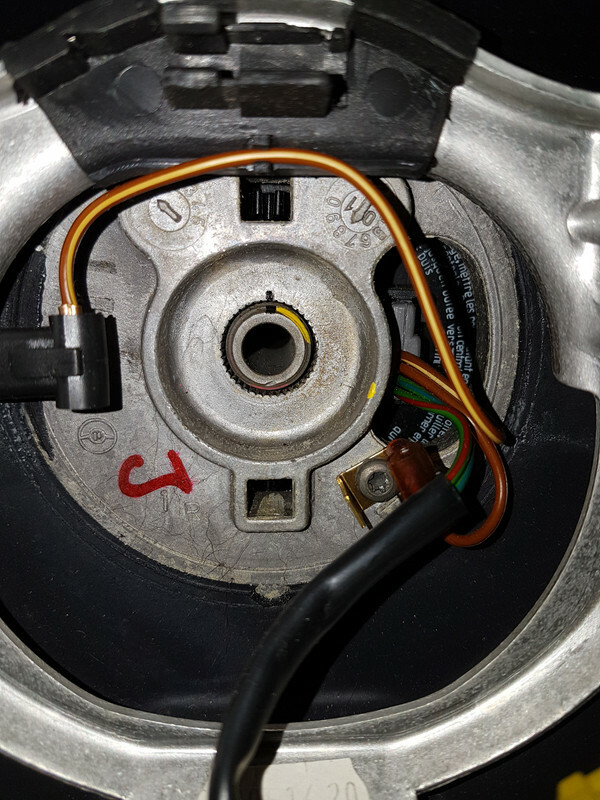 Whilst in there I noticed that the alarm and tilt sensor bracket was a bit scruffy and the tilt sensor connector looks like it needs a good clean, so that has been removed for cleaning up. It appears that the tilt sensor has a lot of fluid inside it. I am not sure if this is just how they are supposed to be or if this one is damaged. There is no obvious way to open it or for water to get in, any ideas? The steering wheel which was in the car looked like it had been chewed. I had a spare one from my C2 which I swapped over to. 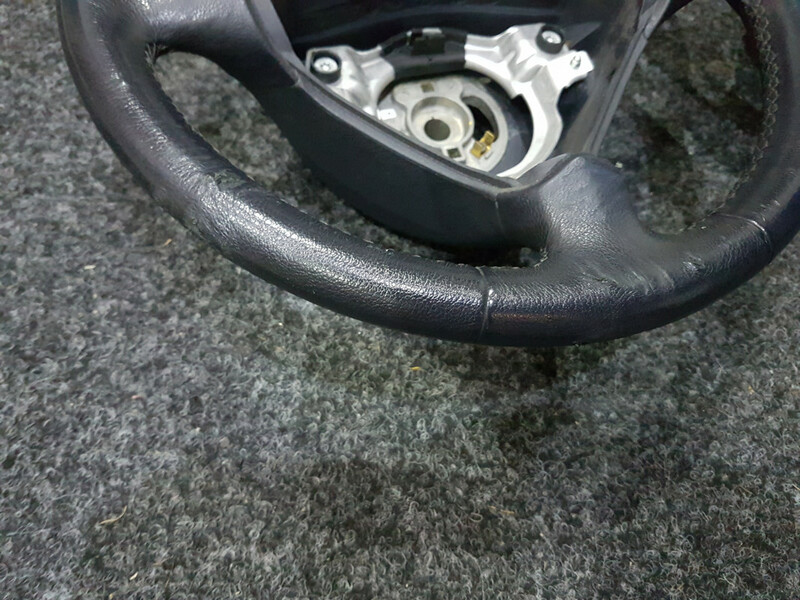 The wheel and airbag were both cleaned up using a very slightly abrasive foam pad and some warm soapy water. The wheel was then refitted, being careful to fit both earth tags and the wavy washer behind the nut. 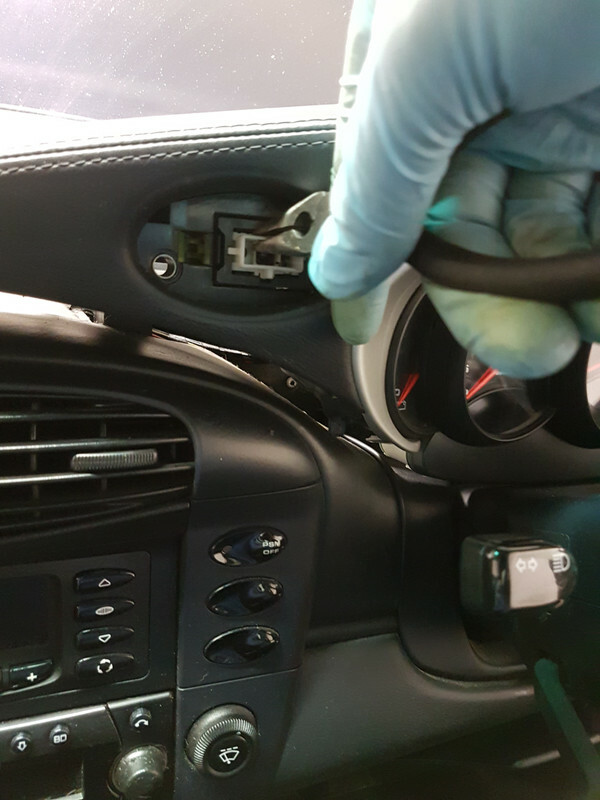 When tightening the nut don't use the steering lock to stop the wheel from turning, hold it. 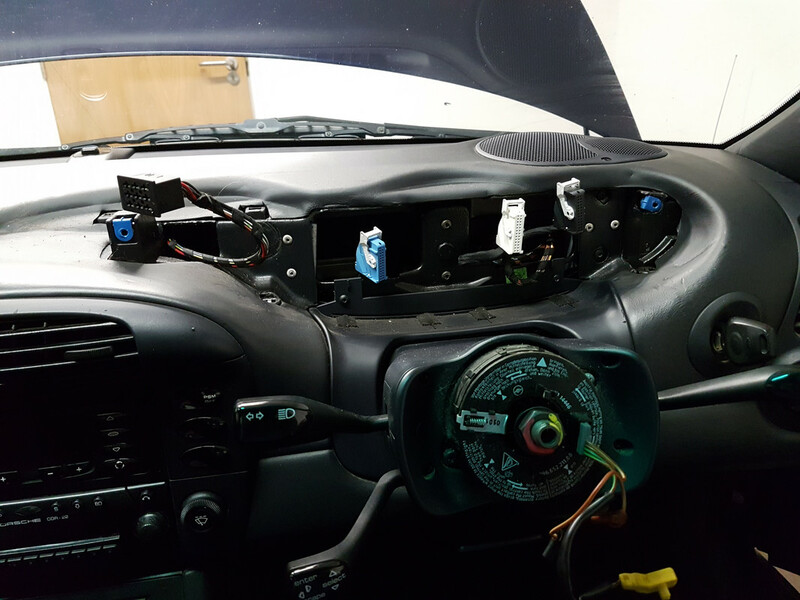 Airbag reconnected and then screwed back in place from behind the wheel. The looks a lot more blue with the flash on than it does in real life! The old wheel will now be sent of to Jack at Royals to be retrimmed in alcantara. I will get the lights out to do that at some point. Have you tried using a heat gun on the scuttle to bring it up? I bought a spare panel to play with some time ago and didn't have any success with it. It either did nothing at all or started to melt the surface. There was no middle ground. I was using a decent temperature controlled gun. 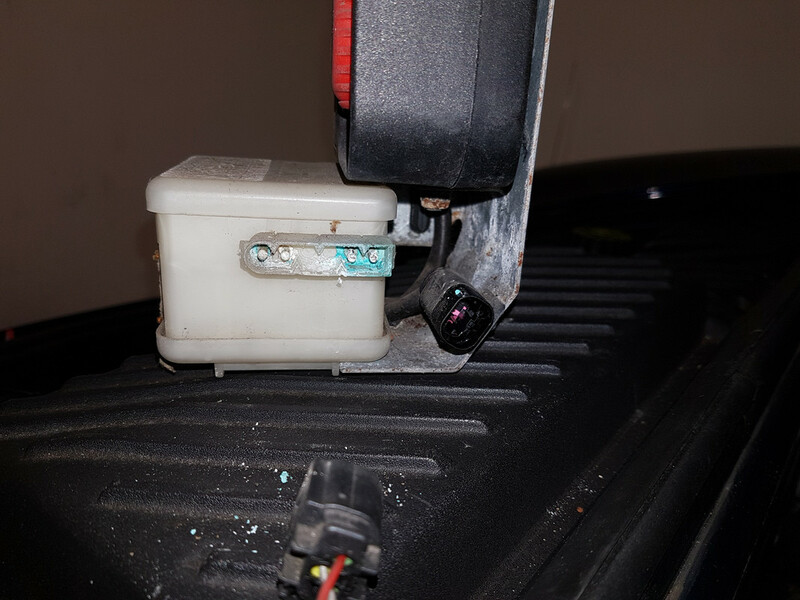 Just read a boxster thread on rentech where the owner drained the fluid out the tilt sensor thinking it was water only to realise it wasn't and thus destroyed the sensor.